Complimentary breakfast coffee parking and Wi-Fi top the list of amenities at the non-smoking Red Roof Inn Marion steps from Matter Park. All 56 rooms at the two-story Red Roof Inn come equipped with free Wi-Fi flat-panel TVs microwaves mini-fridges and coffeemakers. Wake up each morning to feast on an array of complimentary breakfast treats. Guests can also refuel with free java in the lobby. A picnic area is on hand for enjoying alfresco eats. Parking is free. Pets are allowed. The Red Roof Inn lands guests within a 10-minute walk of Matter Park and less than three miles from of downtown Marion. Academics find their niche at Indiana Wesleyan University five miles south while shoppers head to the Five Point Mall less than 10 minutes away. History buffs make the three-mile trip to the Quilters Hall of Fame and James Dean Memorial Theater. 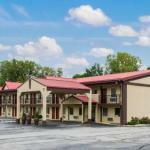 The hotel is eight miles from the Mississinewa 1812 Battlefield. Fort Wayne International Airport is 45 miles away.